The easiest and fastest way to increase the numbers of buyers who see your listing is by promoting each listing on social media. 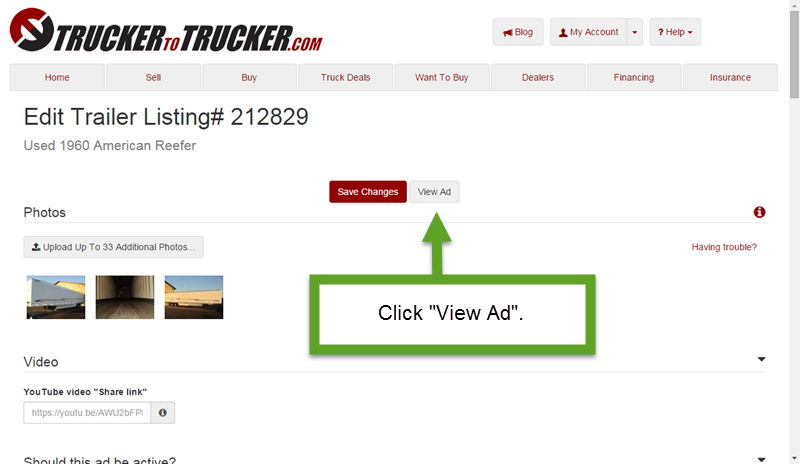 Our 3 minute tutorial shows you step-by-step, so anyone who creates a listing on TruckertoTrucker.com account can do it. Afterwards, you’ll be able to promote your listings in less than 30 seconds on all the major social sites (Facebook, Twitter, Google+) for free. Why Use Social Media At All? If you can click a mouse a few times, you can do all the promotion you need. Don’t have personal or company accounts, yet? Option 1 – Go to Facebook, Twitter, and Google+ and follow their simple directions for creating an account. Option 2 – Grab any teenager off the street and pay them ten bucks. They’ll have you completely set up in 30 minutes. Option 3 – Follow our step-by-step guide coming very soon. Maybe you’re not sold on social media. That is understandable. You are already busy running your business, so why waste your time. The problem is…your buyers use it. And, they expect legitimate dealers and sellers to be online. There is a lot of trust that goes with buying equipment worth anything from a few thousand dollars to over $100k. Your website and social media accounts are the first step to building that trust because it allows the buyer to see that you are a professional company that cares about their reputation and has experience in selling new and used trucking equipment. When more people see your listing, you will get more phone calls. When two competing listings are similar, trust will go to the more professional seller. More competing bids + higher trust from buyers = more sales and higher sale prices. 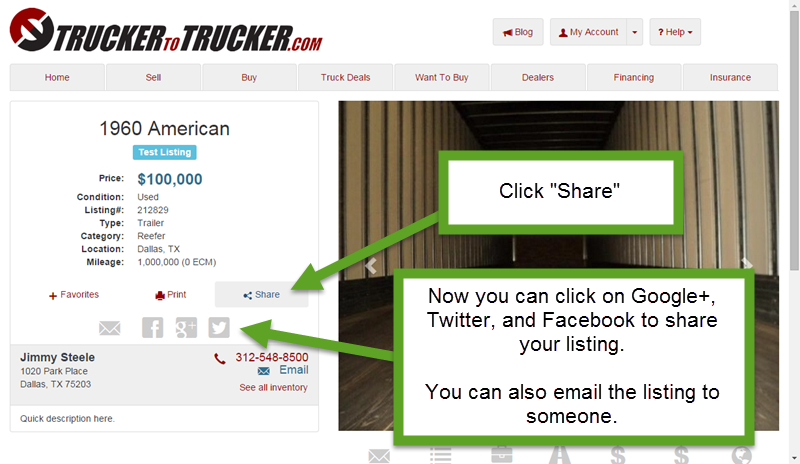 #1 – Log into your TruckertoTrucker.com account. #2 – Log into your company social media accounts. 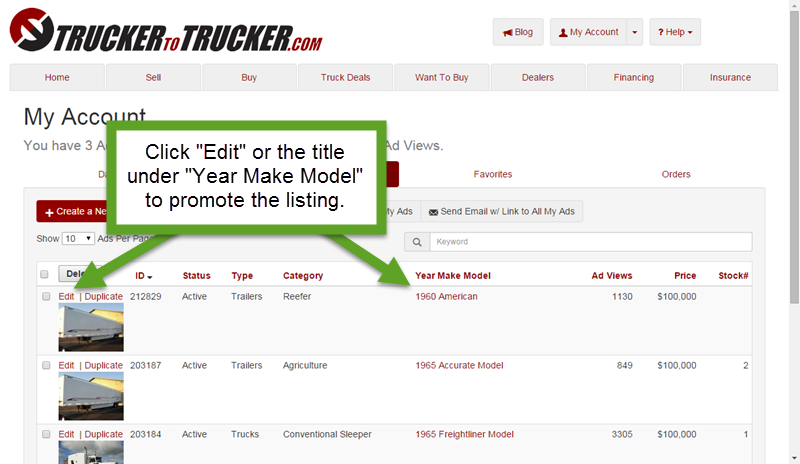 #3 – Click a Listing – You can click “Edit” or the red “Year Make Model” info. #8 – Click Facebook – This is the most complicated to share…but still super easy! 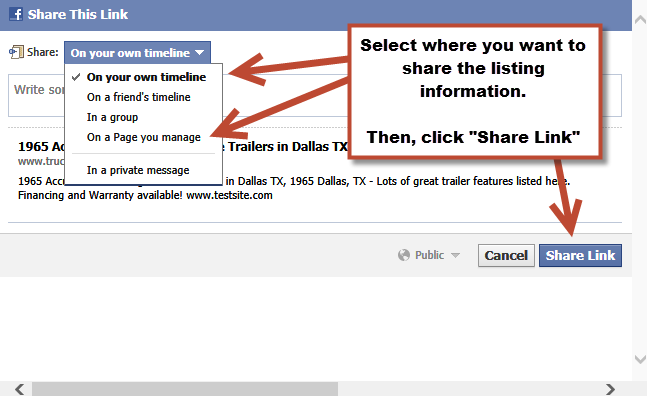 Change the Share location in the top left corner to “On a Page you manage” to select company page. #9 – Click “My Account” at the top of the website to go back to your listings. Now you can promote any of your listings in less than 30 seconds!